My very first tryst with these nutrition packed Laddoos was when I was studying in my first year of Post Grad, my friends and I were preparing for our first semester exams and studied from dawn to dusk, usually at our college itself. For Lunch we visited a nifty little "dudhalaya" (dairy) that doubled up as a restaurant for hungry office goers while simultaneously running main business of making sweetmeats and selling milk and milk products right across the road. Cut to many years later when I was expecting my son, a bad case of morning full day sickness mostly kept me home-bound and all I had for company was the world wide web and just like most expectant mothers do, I read up on any and every piece of information that I could on pregnancy and beyond. That was the first time that I found out that new mums all over the country were made to eat those very Laddoos that I had sampled as a young adult on a hot, sultry afternoon. Dink (in Marathi) Gond or Gondh in Hindi are edible gum crystals. 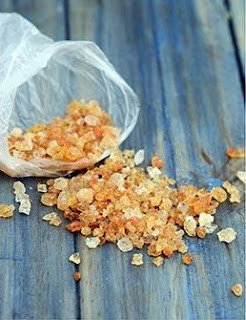 Gond is a natural gum made of hardened sap taken from two sub-Saharan species of the acacia tree, Acacia senegal and Acacia seyal. The tree grows all over Africa and on the Indian subcontinent, in Punjab, Maharashtra, Rajasthan and Gujarat. 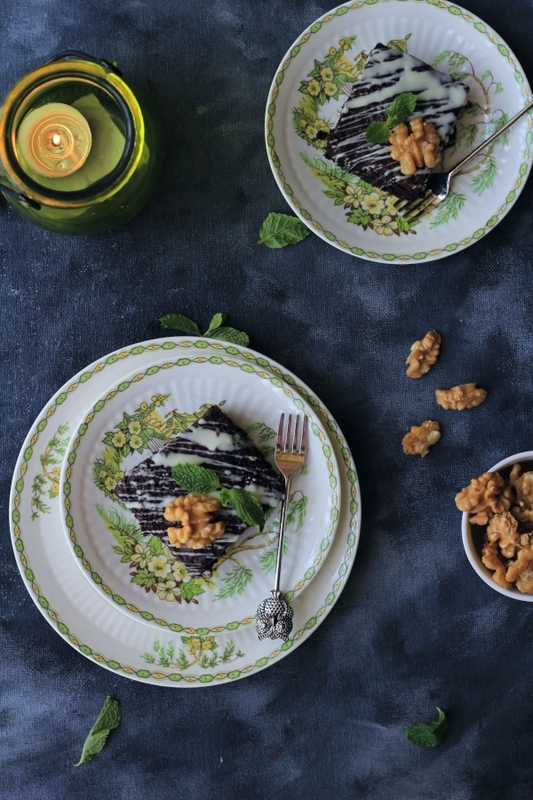 Thanks to its good emulsifying, stabilising and binding properties, the gum is a key ingredient in bakery items, ice-creams, soft drinks, medicines and beauty products. It makes newspaper ink more cohesive. Beer, energy drinks and wine coolers also contain gond. The gum is available as pearly yellowish translucent crystals of varying sizes. The bigger the crystals, the more expensive they get. Its price varies from Rs 200 to Rs 500 per kg. “Most of the demand for gond comes from the food industry,” says Roshan Lal, a gond trader in the wholesale market of Chandni Chowk in old city area of Delhi. In winters, gond demand grows because of its properties to keep the body warm, he adds. Besides protecting against cold, gond has been used to heal wounds. It is also known to treat cardiovascular ailments and chronic kidney diseases. Doctors recommend gond for patients of celiac disease—a digestive disorder that occurs when the immune system mounts an inflammatory response to gluten, found in wheat, rye and barley. A study published in The American Journal of Cardiology says that gond can help lower cholesterol. The use of gond in medicine dates back about 5,000 years to the time of ancient Egyptians. Post delivery, my father regularly got me these lovelies from a Maharashtrian run sweet shop right across town and I vouch for their nutritional properties myself. 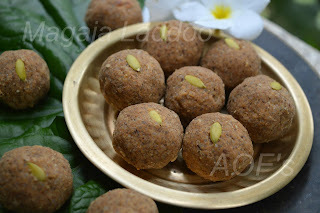 Today on the auspicious occasion of Ganesh Chaturti as people all over the country get busy making the Lords favourite sweets, I wish to share a recipe for these heavenly dumplings that I often make for my toddler when there is a nip in the air and immunity needs a little boost. I urge you to make these for the sweet Lord Ganesha or for your children and new mums with this easy and extremely satisfying recipe soon. Grate the coconut and roast it in a little ghee until very light brown. Now Pound 1/4th of the gum into a coarse powder and keep aside. Note : The gum cooks very quickly. when frying add very little at a time. Make sure that the gum does not burn or become dark brown. Roast the Khus Khus and keep aside. Dry roast the almonds and the cashews until slightly golden brown and keep aside. Add all the dry ingredients in a big bowl except for the sugar. In another pot add the sugar and add 1/2 of a cup of water. Boil the mixture until you achieve a one-thread consistency. Add all the ingredients into the sugar syrup and mix well. Rub your hands with a little ghee. Carefully take a handful of the mixture and roll into balls. keep aside. It maybe necessary to roll the balls roughly at first. Once all the balls are formed. Go back and re-roll the balls to give them finesse. Looking for more recipes for the lovable Lord? 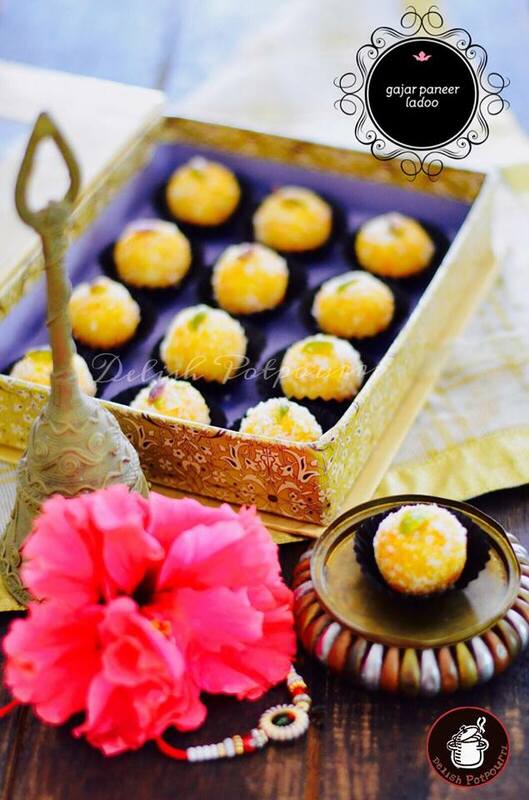 and these heavenly Gajar Paneer Laddoos from Delish Potpourri. One of my favourites I must say Pari....lovely share.